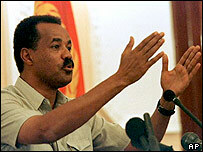 Melese Zenawie Needs Eritrea to save him from the Election Storm…”Frère ennemie” …he acts like they never fought before? ADDIS ABABA (Reuters) – Ethiopian Prime Minister Meles Zenawi said he is willing to meet Eritrean President Isaias Afwerki despite more than 10 years of bitter words and a bloody border war. Eritrea last month accused Ethiopia of blocking its participation in African Union (AU) summits in Ethiopian capital Addis Ababa — seat of the 53-nation body. Responding to questions, Meles denied the claims and said Isaias was welcome in Ethiopia. “If the Eritrean government is eager to send any person, whether the president himself or any person, and participate in meetings they will be treated exactly like any other delegation,” Meles told reporters late on Thursday. Meles said it was Addis Ababa’s obligation as AU headquarters. The 1998-2000 war between two of the world’s poorest countries killed at least 70,000 people. An independent border commission in 2002 awarded the flashpoint town of Badme to Eritrea but Ethiopia still occupies the territory. 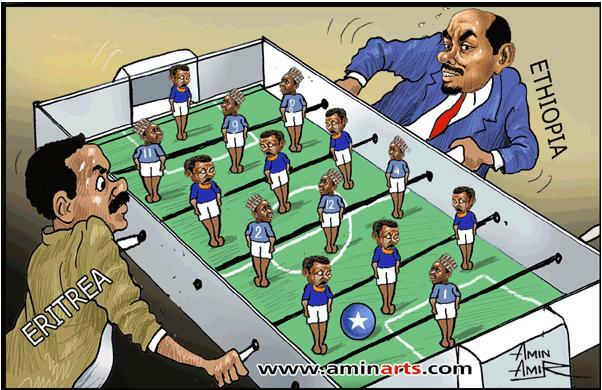 Meles did not say whether he was willing to discuss the border issue. “I have no obligation to meet him at the airport,” Meles added. In December, the U.N. Security Council imposed sanctions on Eritrea, accusing it of backing rebel groups in Somalia, where at least 21,000 people have been killed in violence since the beginning of 2007. The sanctions, adopted in December and backed by 13 of the 15 members of the U.N. Security Council, include an arms embargo, travel restrictions and asset freezes for some of the country’s top officials. Asmara says the Security Council is a proxy for the United States and says the multi-state body continues to ignore the fact that their territory is being occupied by Ethiopia, Washington’s strongest ally in the Horn of Africa. March 18, 2010 (ADDIS ABABA) – 15 Eritrean air force members have reportedly fled Eritrea, seeking political asylum to an undisclosed government. An exiled opposition website – assenna.com recently claimed receiving details of the Air force group including list of their names, however declined to publicize details for safety reasons. “Although loyalty is one of the several criterions to join the Eritrean air force, many of them had already defected the PFDJ regime in a similar manner. The repeated mass defection of its skilled officers has undermined the young Eritrean Air force significantly.’’ It Said. There is no an immediate comment from officials in Eritrea and the report can’t independently be verified at this point. The Eritrean Air Force was established shortly after Eritrean War of Independence in 1994. The make-up of the original force was composed of aircraft that were abandoned by the then defeated armed forces of the Derg regime. Expansion of the Eritrean Air Force (ERAF) did not occur until the Eritrean-Ethiopian War in which the two air forces fought for superiority. In a sort of arms race, Eritrea responded to Ethiopia’s purchase of Su-27s with a purchase of MiG-29s. In 2000 the ERAF bought eight Su-25s from Georgia, and six more MiG-29’s from Moldavia. In 2003 Eritrea also acquired several Su-27s. The Eritrean Air Force is a smaller branch of the Eritrean Defence Forces. If confirmed, the latest report would be a big blow to President Issayas Afeworki-led government who repeatedly denied the worsening fleeing away of citizens to neighboring countries. In a recent interview with Al Jazeera, President Issayas denied any knowledge to the defection of the country’s national football team in December last year in Kenya, Instead he said it was a “fresh news” to him. However it was then confirmed by the ministry of information. Eritrean borders are heavily patrolled by border guards and thousands of Eritreans risk their life attempting to cross to neighboring countries. Eritrean refugees who recently made it to Ethiopia told Sudan Tribune that a shot to kill policy is intensified along the border. Wegahta radio this week reported the killing of 12 Eritrean refugees (all from Asmara’s Mai-temenai sub-city) by border guards up on attempt to cross to Sudan. The UNHCR recently reported from Sudan that the exodus out of Eritrea is reaching alarming stages. In protest to country’s mandatory military service, tens of thousands of young Eritreans find eastern Sudan as their main transit to cross to Europe or Israel for better life. In Ethiopia alone, there are nearly 50,000 Eritrean refugees in three camps, a-third of them being members of the Eritrean military. According to Administration for Refugees and Returnees Affairs (ARRA), the current influx of Eritreans to Ethiopia stands at 1,800 a month.